4 Isikulu - Umdloti Beach Accommodation. 4 Isikulu is situated right on the beach in the select coastal village of Umdloti. Put together by a local North Coast interior designer, this modern beach apartment boasts 3 bedrooms and 2 bathrooms, with direct access to the beach. The apartment is an easy 400m stroll to the famous Umdloti tidal pool which is perfect for the kids and family. 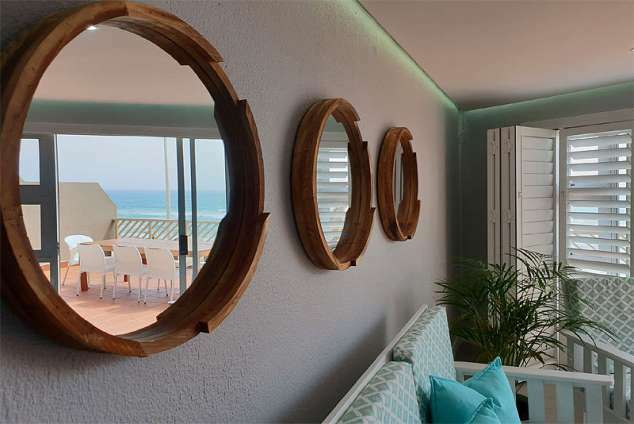 Main bedroom boasts incredible sea views and direct access to the large balcony. The en-suite off the main bedroom has a walk-in double shower with views of the ocean and a his & hers double basin. 2nd and 3rd bedrooms have two single beds each. Can be made up together on request. 2nd bathroom with shower, basin and toilet. TV with all DSTV channels. Airconditioning in lounge/dining area and main bedroom. Ceiling fans in all 3 bedrooms. Lockable box with keypad for valuables. Balcony has view of swimming pool in apartment complex. Open plan kitchen includes oven, hob, microwave, fridge, freezer and dishwasher. Single undercover parking bay, plenty of additional secure on site open parking. The apartment will be serviced Mondays, Wednesdays and Fridays (excluding public holidays) – should your stay be longer than 7 days your linen will be changed over once. 2306 page views since 28 Nov, 2018. Last updated on 15 Jan, 2019.